Duo of female vocals and guitar playing 2 x 50 minute sets over 2 hour period. Perfect for drinks reception, wedding breakfast or dinner. Play for wedding ceremony including music as guests are seated, entrance, signing and exit. Wedding ceremony followed by 2 x 45 minute sets over a 2 hour period. 3 x 45 minute sets as required during drinks and wedding breakfast, or just 3 x 45 minute sets over a 3 hour period. Wedding ceremony followed by 3 x 45 minute sets during drinks and wedding breakfast over a 3 hour period. An additional hourly charge for performances continuing past midnight. Charge per hour to extend the booking period. This does not add extra performance time. Polly and Ian are professional session musicians who have performed with high-profile artists such as Simon Webbe and Will Mellor. Their successes also include live perfomances on the BBC, regular performances for Leiceter City Football Club and a performance in the Banqueting House in Whitehall. 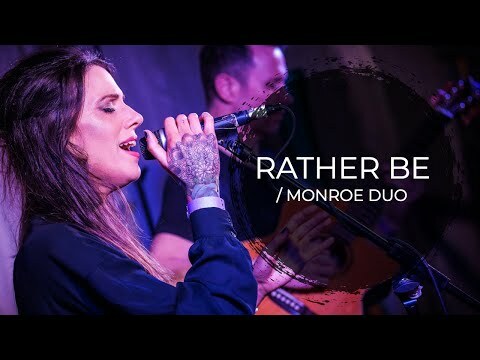 Perfectly suited for smaller venues, events with sound restrictions or for early evening/afternoon entertainment at weddings and larger events, Monroe provide a classy, laid-back alternative or warm-up to the typical full function band. Monroe's repertoire includes Jazz standards from Ella Fitzgerald and Etta James, through to Rock and Roll, and recent hits from Jessie J and Adele. Please hit the repertoire tab below for a full song list. Polly has a extensive background in classical and contemporary music. She has performed with a huge range of live acts including Will Mellor at the National NHS Awards and live on the BBC. Polly's talent has seen her work with dance producers from Hospital Records, Moda Black and Spearhead. Ian has been working as a professional session musician for the last 15 years. His most recent work includes performing alongside Simon Webbe (formerly of Blue) and producing his own music for television and advertising. He has also played on albums for Errol Brown, David Benoit, Down to the Bone and Roger Sanchez, plus performed live with top American jazz musicians Reuben Wilson and Eddie Henderson. If you are looking for a band to rock your party in the evening then why not book Monroe Band? The band features Polly and Ian plus bass and drums to get everyone at the party on thier feet. Click here to see the band's full page. A discount of £50 is applied to any band booking that is added to a duo booking. Polly and Ian were simply a perfect part of the day. So many people have commented on your sound being a beautiful compliment to the surroundings and all that was going on from before Meg arrived, through the ceremony and during the reception. I have to say that my daughter and then Meg walking in as you played Caravan of Love broke me in a very good way! You have both also made a fan for life in the form of our nephew William who hasn't stopped talking about how good you were! We can't thank you and the band enough for all you did. It was exactly what we wanted and everyone really enjoyed it. You'll be recommended to all our friends! Just a short note to say a big thank you to you and Ian for providing the music on Saturday. Our guests had a wonderful relaxing evening, which is just what we wanted, and we managed to enjoy it as well! The background music was ideal. We have provided your contact details to some, so many compliments about Ian’s playing and your lovely voice. Just wanted to say another big thank you to you and Ian 😊 everyone couldn't get over how great you both were and it was just the perfect mix of music! I would like to say that your self and Ian were wonderful and truely talented one of my guests said you have the voice of an angel and we all throughly enjoyed listening to you. Im sad i didnt get to listen to all of your sets and said this to my daughter yesterday she made a brilliant suggestion of having an evening out in leicester and coming to one of your gigs sounds like a great plan which i am looking very much forward too. Very best wishes and see you soon. Hi Polly, we came to see your Monroe gig on Saturday night in Loughborough. We thought you guys we're awsome. We booked you for our wedding on September 3rd next year a few months ago with DG music. We were so impressed with your videos on the Web site and we wanted to see you live and it was even better. You have such a beautiful voice. I couldn't get "After Glow" out of my head afterwards I loved it. Really looking forward to seeing you guys again and having your talents at our wedding. Thunga & I just wanted to say a massive thank you for performing at our wedding. The music was perfect (I blame you for making me cry on the entrance music 😉) and everyone had an amazing time. Thank you also for learning the songs we wanted...that made the day really special for us. And for lending some equipment...absolute super stars!! Lots of the aunts & uncles have been saying how beautiful & wonderful the music was and you were all a massive hit. So thank you from the bottom of our hearts we couldn't have picked a better band. We cannot thank you enough for making our day even more special. Our guests praised you both for how amazing you were and my little boy loved listening to Ian's guitar skills. Thank you for learning our first dance. It was just perfect and I'd love to hear it again. Couldn't recommend these guys highly enough. Love them. A big thank you to you and Ian. You really helped make my party very special and everyone absolutely loved you. Thank you. 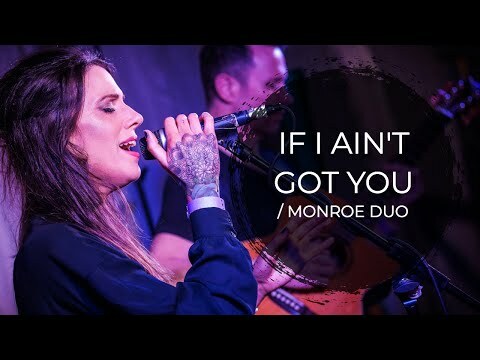 We saw Monroe Duo on Friday and they were amazing :) I'll be phoning up to book. I just wanted to say a massive thank you from both of us for making our wedding day so perfect. Monroe were just fantastic and exactly what I had hoped you would be. All our guests were wowed by you both and our wedding day really wouldn't have been the same without you. We had Monroe perform for us on Saturday evening. I would just like to pass on my thanks and praise to Polly and her partner, it was an absolutely fantastic evening and her performance was outstanding. All our guests had a fantastic time and couldn’t praise the group enough. A very professional performance. Thank you also to yourselves for the very smooth service I received, I would highly recommend working with yourselves again. We just wanted to say a big thank you for making our evening reception perfect. You were amazing. Monroe have played for us on several occasions and they have never failed to create a great atmosphere - they're fun, professional and very, very talented! Booking Monroe was a pleasure from start to finish. They were professional, friendly and even added tracks to their setlist especially for our event. They sounded fantastic on the night, too! What a class act! Polly's voice is just beautiful. We had so much wonderful feedback from our guests, thank you so much. Monroe gave a flawless performance. They were a very stylish and classy addition to our day! 2 x 50 minute sets (default): Duo of female vocals and guitar playing 2 x 50 minute sets over 2 hour period. Perfect for drinks reception, wedding breakfast or dinner. Wedding Ceremony: Play for wedding ceremony including music as guests are seated, entrance, signing and exit. Ceremony & Drinks: Wedding ceremony followed by 2 x 45 minute sets over a 2 hour period. Ceremony, Drinks & Wedding Breakfast: Wedding ceremony followed by 3 x 45 minute sets during drinks and wedding breakfast over a 3 hour period. Drinks & Wedding Breakfast: 3 x 45 minute sets as required during drinks and wedding breakfast, or just 3 x 45 minute sets over a 3 hour period. Hospitality/Artist Rider: Soft drinks as required. Technical Requirement: 2 x 13 amp sockets and space for 2 speakers on stands plus space for small mixing desk.